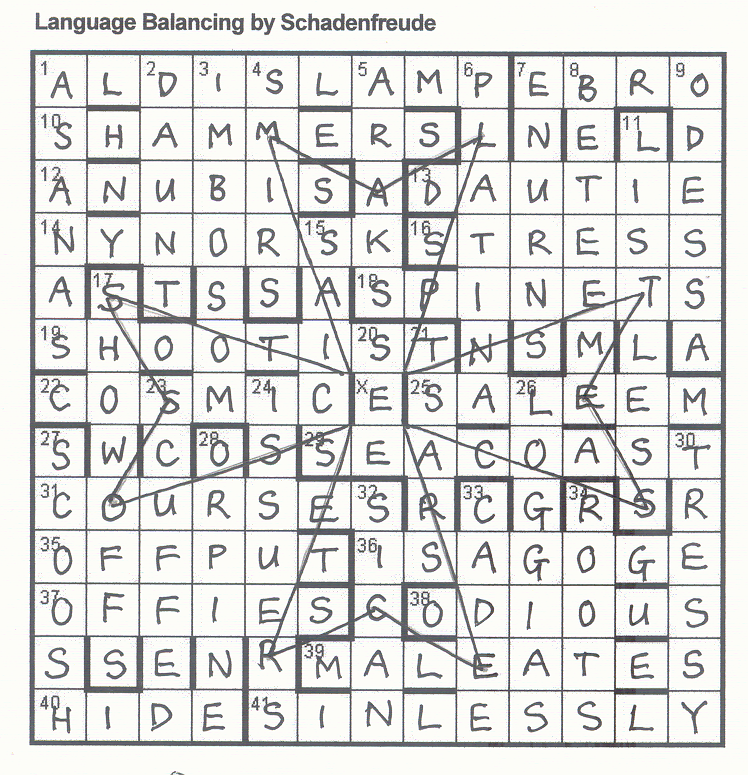 Schadenfreude has a great reputation so the numpties knew that this one was going to be a splendid crossword to solve. After we had gazed at it in near desperation for a couple of hours, and solved one clue (34d ‘Old or obstinate climbing plants’ – we had STOOR – but what was climbing? The plants or the old word for ‘obstinate’ – of course, we opted for the wrong one, so technically we had nothing at all in our grid) we weren’t sure there was going to be any splendid solve for us. Progress came in one wild rush. I still don’t know what ‘Language Balancing’ has to do with the solution but we spotted NYNORSK ‘Foreign language new year number is “gold”, extremely slick’ (7). I learned to speak Nynorsk many years ago and struggled with the fact that ‘siv’ was replacing ‘sju’ and that everybody said both words to you to be sure that you understood – should have got that one sooner! We solved SHAMERS, SIRS, PATINA and ARKS and realized in a flash of brilliance (well, it was the other half of the numpty team!) that the polygon had to be a Maltese cross. No holding us now. Chambers yielded ‘MECHANISM PROVIDING INTERMITTENT FRAME BY FRAME MOVEMENT IN MOTION PICTURE FILM PROJECTOR’. It was not difficult to extract those letters and words from clues, leaving us with far easier clues to solve. With the solutions that now leapt into view, the grid filled. We could draw our polygon; it was clear where the remaining empty cells were going to be. So we drew in the eight points of the Maltese cross and fed M A L T E S E C R O S S into them. Yes, I know we were going about this in an upside-down fashion – the usual numpty way – and not studiously solving clue by clue. With all that help in place, asking our word-finder to find words that could have the extra letter in the appropriate place now helped us to solve our remaining clues. Along the way, we recognised the brilliance of Schadenfreude in some of those astonishing words that could take in extra letters and fulfil his needs. With our Scottish background, we know the word HOWFFS, of course, but who would have thought a bit of Maltese Cross could be tangled with it to create SHOWOFFS? Yes, SALEM becoming SALEEM did require the appendix and was slightly below the brilliant level of the rest but anyone who grumbles should be challenged to produce something comparable. This was sheer joy and brilliant. Thank you Schadenfreude! It would be interesting to know why anyone should not wish to have the world’s libraries at one’s fingertips. Surely, the time when discerning individuals might see the Internet as a vice ridden mine of misinformation is long gone. Has it not served this minority interest of ours most admirably for a decade now? My only caveat is that powerful search engines and certain word applications have made completing puzzles considerably easier. You can of course limit the use of these things but, for example, I think it highly unlikely that I shall ever again read through an entire Shakespeare play in order to complete one of Salamanca’s Plays of the Bard series. 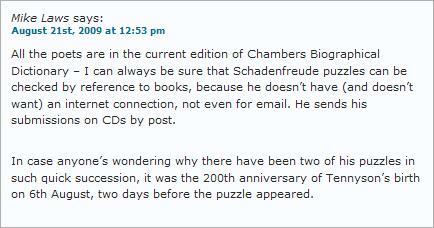 Although Schadenfreude has an Inquisitor puzzle every month or two, his Listener visits (once or twice a year) are something to look forwrad to. His last (4060, BAT) revealed his PIN number, and the one before (4034, Overhead Reduction) was based on the phrase “cutting out the middle man”. 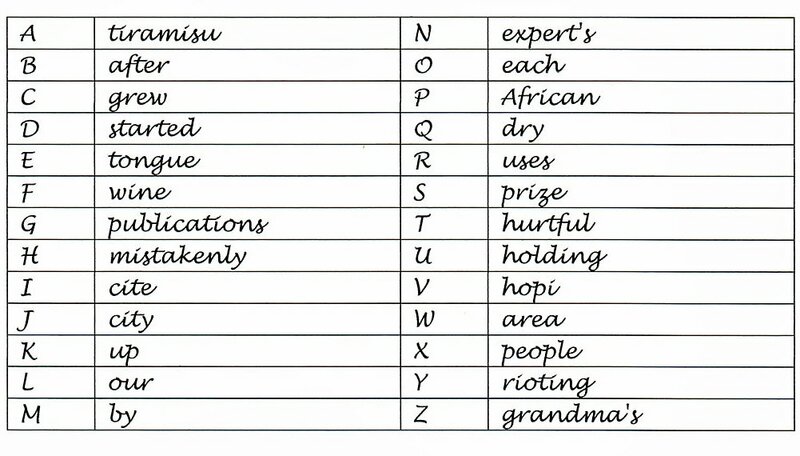 In Language Balancing, one letter or word has to be removed from each clue to spell out the definition of a phrase. Schadenfreude (as Oxymoron) has used this letter/word technique at least once before (EV 910, All the Initials), and I seem to remember it was great fun. Once the grid is complete, there will be some empty cells which will need filling. I started off quickly, with the river EBRO at 7ac (Clive becoming Live in the clue), followed by STRESS at 16ac, with the letter M being dropped. Don’t ask me how I got COMIC at 22ac! Bunty for Bounty seemed the only possible word that could lose a letter, and the comic for girls was the obvious reference, confirmed by the wordplay IC after COM (for commerce). (I must stress that I was a Dandy and Beano boy!) Here we also had our first answer that doesn’t fill its length, and COSMIC seems to be very likely for its entry. No more acrosses made themselves known, and I wondered whether I should give the clues more of a chance on my first pass through; normally it’s only 20 or 30 seconds. Anyway, next is 4dn SIRS, with the last R dropped from ruler, and then PATINA at 6dn (with my first word to be dropped, ME). Both these were just one short of their entry length, so it didn’t look as though there would be too much empty space at the end. A few more clues finally got solved, and most were in the top half of the grid, so that is where I concentrated my efforts over the next hour or so. I decided to look more closely at the entries that were likely to have empty cells: SHAM.ERS/S.IRS, AR.KS and P.ATINA. SHAMMERS/SMIRS, ARAKS and PLATINA seemed to be the main (if not only) candidates, and reading left to right, I got MAL. MALTESE FALCON or MALTESE CROSS perhaps. I also had MECHANISM being spelt out by the dropped elements of the acrosses, and MOVEMENT in the downs. A quick check in Chambers revealed a Maltese cross to be (apart from the medal) the “mechanism providing intermittent frame-by-frame movement in a motion picture film projector”. It didn’t take much more studying of my grid at this point to realise that the letters added to the grid to make new words, when connected as required by the preamble, gave the shape of the medal itself. A very pleasing result. Sadly, all this meant that the clues could be corrected and the rest of the puzzle (ie the bottom half) solved reasonably quickly … probably about 2½ hours all told. However, they were some good clues on the way, and HOWFFS transforming into SHOW-OFFS was a delight. All in all, a fine puzzle by one of the masters. Not uncommonly, I also got nicely distracted when I solved 1ac ALDIS LAMP, with a nice little foray into the world of Monty Python. 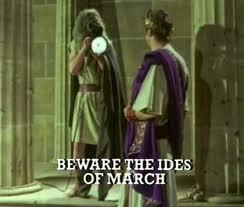 Remember The Semaphore Version of Wuthering Heights and Julius Caesar on an Aldis Lamp?! Finally, here’s a picture I found of the mechanical type of Maltese Cross on Wikipedia. What a pleasure to be spotting solutions as the crossword rolls off the printer. REPS was the first we saw and it gave the game away immediately (Agents rely on records) R on EPS left us with ELY and a quick run through a list of herbs suggested that CIC was the remainder of CICELY. Obviously, as the fair and succinct preamble told us, we were going to pick CIC out of one of the across clues. We were off on a very productive herb hunt and by the end of Friday had eleven of our twelve herbs (the clue lengths had given away how many letters we were expecting to remove from our across solutions and we rightly assumed – with reference to the title, Half-Thyme- that the same number would come out of down clues). This was fun! PURPIE in (PUR)POSELESSNESS, 39ac and (pie) 24d. We noted, of course, that even out in his garden, Dipper was indulging in the usual oenophilic Listener dose of a drop of Sauterne – but we have come to expect that by now – and not even the convenient ASTI filler! No doubt, soon, we’ll have one set entirely round an oenophilic theme! We needed a twelfth herb and had only its second half LL (from 33d – ECHO – ‘Repeat part of PurceLL chorus). Evidently DI had to be hiding in the solution of our remaining unsolved across clue, ‘Dividing line is base minus unknown angular unit’. This is the numpty solving blog, so, obviously we didn’t simply solve the clue (RADI with the X ‘unknown’ removed, dividing STEAN – to line, providing STERADIAN). We gazed, instead, at the clashes (wondering how seven clashes could produce a 9,6 thematic phrase) and, by a stroke of luck, spotted PATERSON’S CURSE. A quick check in Chambers revealed that the poor Aussie, Paterson, was cursed by ‘any of various naturalized orig European herbs regarded as harmful to livestock’. Almost there. We now had ?T?R? ?N to find, with DI to slot in somewhere. A bit of conjuring with the Chambers CD and hey presto, another new word for me, STERADIAN. In one evening the Listener teaches me that Aussie cows don’t thrive on mint and that ‘steradian’ is the derived SI unit of solid angle. Life will never be the same. 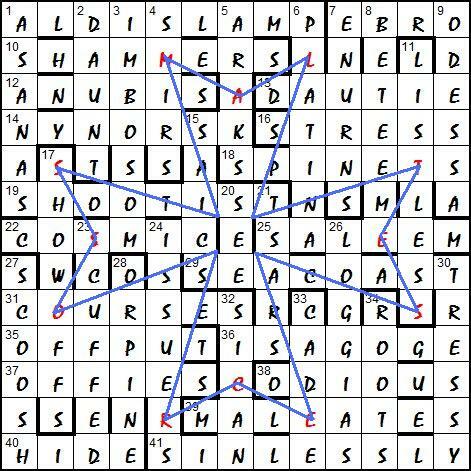 I thought this was a super crossword with lovely fair clues and no ludicrous cruciverbal hoops to jump through. Many thanks to Dipper. Mr E’s sixth Listener, and his second this year. His last two have been his golf score card and one with the instruction to cut part of the diagram, cut it in half and send it with the rest of the grid. As a result of these, and others, Mr E is a setter who’s puzzles I really look forward to, although one day I’m sure he will trip me up. The preamble has no reference to clashing letters, my current bête noir, but states that most clues contain ‘what seems to be an arbitrary irregularity’. Hmmm, that sounds ominous. I may be hankering after clashes before too long. Unfortunately (and I mean that), the challenge from Mr E didn’t last too long, and the irregularities unfolded pretty quickly. 14ac Old slave’s tongue nearly cut (4) must be good old ESNE, which here looks as though it’s trying to be a hidden word. Then 18ac Each lecturer held in care of Queen’s prison (6) looks like it’s COOLER with OL in CO plus ER, although the first O seems a bit of a mystery. A bit of a gap now, with 3dn being the next clue solved, European Union holding up half of team’s money (6) and we have EU and ELE(ven), with Bradford revealing EKUELE. So how about one word in each clue being a letter of the alphabet: O for each in 18ac, E for tongue in 14ac and K for up in 3dn? It looks promising, but this is the Listener, and I’ve still got to work out how to use this information in conjunction with two unclued entries and three normal clues. I’m sure trouble lies ahead. 4dn looks like it’ll be an anagram of Belém teams I and another letter, but a bit of doodling fails to reveal an obvious word. 8dn’s obligation must be ONUS and 28dn is ZARF, both seemingliy normal clues. So I’m guessing that they contain different letters of the alphabet. 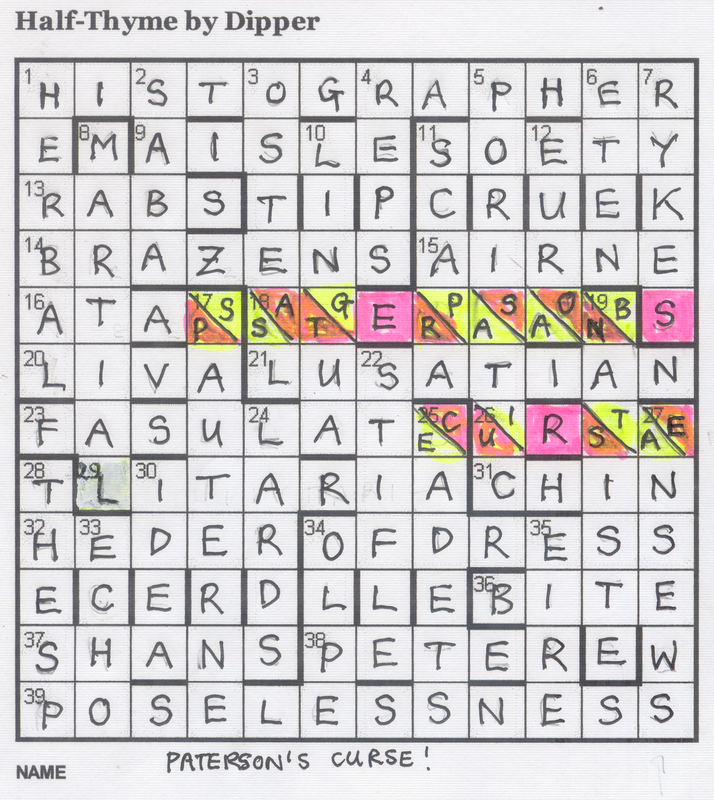 A quick count of clues, and there are 29, so how about three normal ones and 26 where one word in each is replaced by a letter of the alphabet, each being used once. Finally in my first pass through the clues, I get 29dn which is HIVE, another normal clue. So I have six clues solved and the beginnings of the theme sorted, but no idea what to do next … except get solving! 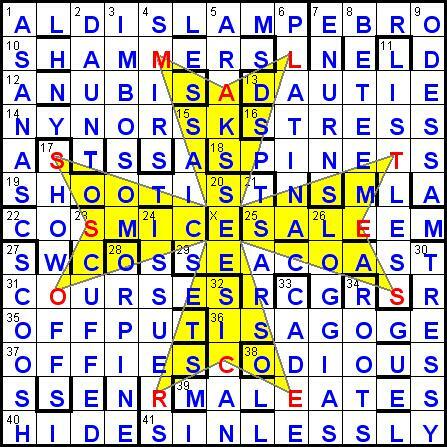 Despite knowing what I know about one word in each clue representing a single letter, some of them are reluctant to be teased out, although EMBLEMATISED/S is a good start (with help from Bradfords which has EMBLEM under Represent). I must say, however, that I thought the device great fun; does anyone know if it has been used before? HIVE Mistakenly cite hopi tongue and we get a clue to ETHIOPIC at 5ac … excellent! Looking at the four remaining unclued entries, we have 11ac P.CKM.W (PICKMAW? ), 33ac L.DYB.G (LADYBUG? ), and probably ROSETTA and ILLUSTRATEDS. My guess is that the first two use the letters of the alphabet not used for the three clues already constructed. Using our letter substitutions for P.CKM.W, we get African ? grew up getting ? area, with city (J) and dry (Q) fitting the gaps to give a clue to ROSETTA (ROSE + TT + A). L.DYB.G gives Our ? started rioting after ? publications, the final two letters (X and T) being used to fill the gaps with people and hurtful, thus giving ILLUSTRATEDS (US + anag STARTED after ILL). So, another nice puzzle from Mr E, although not as hard as some of his other offerings, but nevertheless very entertaining. He is still high on my list of setters to look forward to.